A friend is traveling back to Accra tonight, and sent a picture what she is bringing back: asparagus, cauliflower, greens, Ryvita and red wine. Yes, we travel with vegetables! Accra does have vegetables, but sometimes limited options, and anything imported is SO expensive. I am thus always happy to read blogs with ingredients I can actually buy here (affordably), so I bookmarked Vegetarian Dad’s Bombay Potato Stuffed Aubergines a few months ago. He has some excellent recipes. I did intend to follow his recipe, but with eeny-weeny baby brinjals rather than big aubergines, and a movie night waiting, this as what we made instead, which was rather a detour: sliced aubergines, gently cooked, then baked in a creole-spiced tomato sauce until quite silky, with a potato topping and a smattering of cheese. 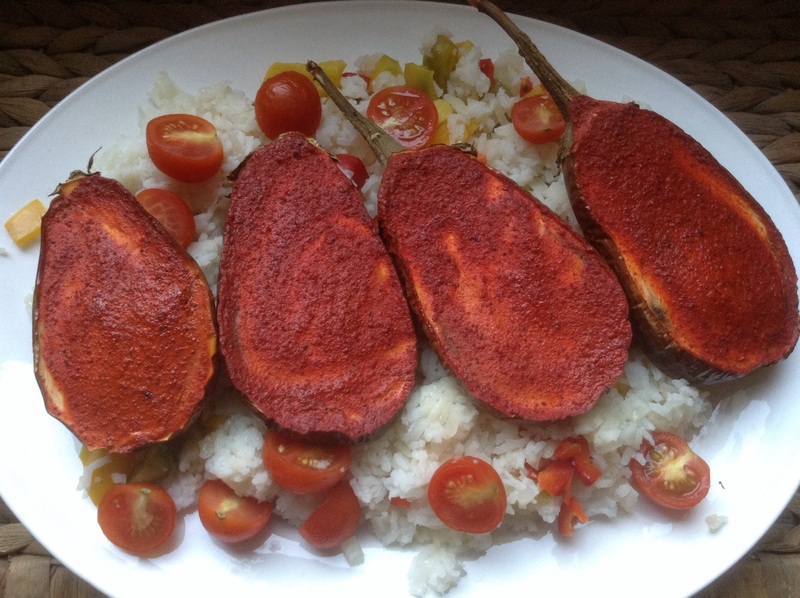 Those Bombay Potato Stuffed Aubergines are still on my to-make list, though, as they look amazing. Slice the small aubergines into 3mm or thick slices, and batch fry them on both sides in a little oil. If you have big aubergines, halve them before slicing them (mainly as this was destined for one-bowl eating in a sofa, with a fork. You may be a civilized person who eats dinner at a table and even uses a knife – then the slice dimensions are entirely up to you.) If you have olive oil, that is probably better. Do not crowd the aubergine slices. 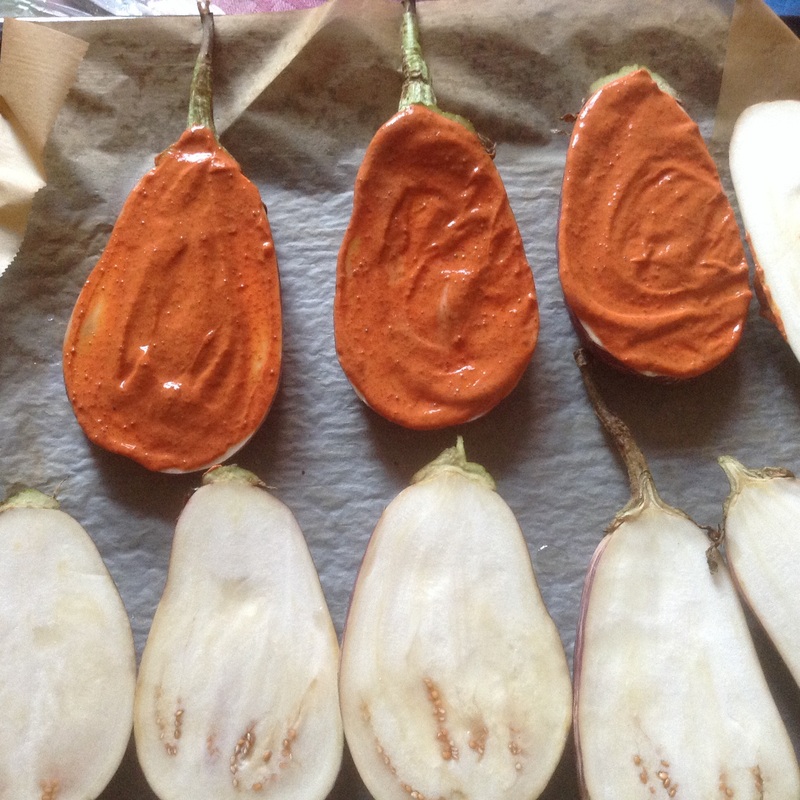 Fry until the aubergine is soft and starting to brown lightly. Take out the aubergine and put it in a baking dish (here, a square Pyrex). Heat the oven to 200C. Tip the spicy tomato-potato mix on top of the aubergine, and pop the baking dish on middle rack of the oven. I added a handful of leftover brie lurking in the fridge. The brie had been frozen and crumbled nicely. Of course, that is not generally a kind way to treat brie, but in a tropical country where cheese is expensive, freezing cheese is a tactical decision. Bake in the oven for 20-25 minutes or so, until the tomato sauce bubbles up and the potato layer is cooked through (just past al dente) but not dry. Optional: enjoy from a bowl in your lap, while watching “The Greatest Showman”. And I’m marching on to the beat I drum….. This is really not a pretty dish, and not what was planned, but it was actually very satisfying. The flavors and textures worked well, and the base layer of aubergines was really excellent. I’ll try some more variations of this. 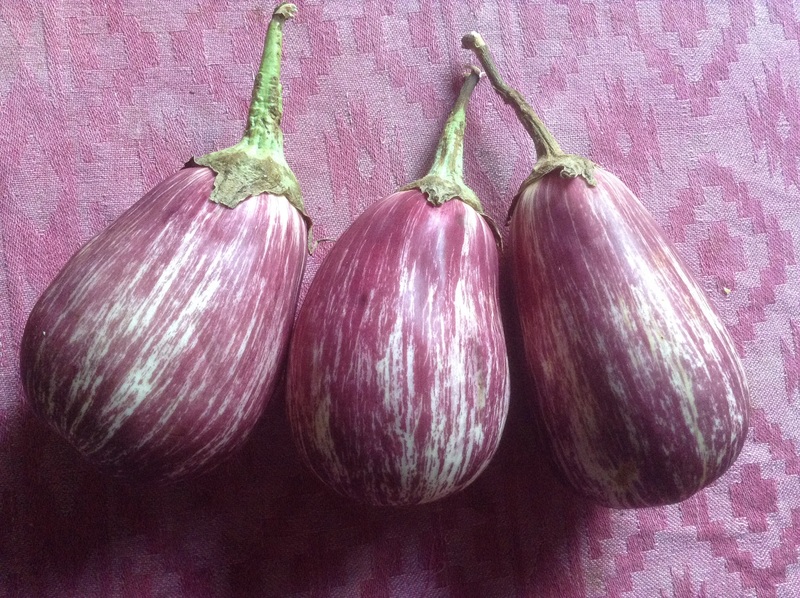 This entry was posted in food and tagged aubergines, living in Accra, potato, vegetarian on May 13, 2018 by krumkaker. Ottolenghi can generally do no wrong, so when The Guardian had his recipes from Puglia, that certainly had to be tried. However, I tweaked his recipe. Blasphemy, I know! However, a) I had an aubergine shortage and b) no breadcrumbs, but was c) too hungry to go shopping, and d) am not fond of deepfrying food. Hence the tweaks. These were SO good though! Definitely something for fans of roasted vegetables to try! Heat the oven to 230C. 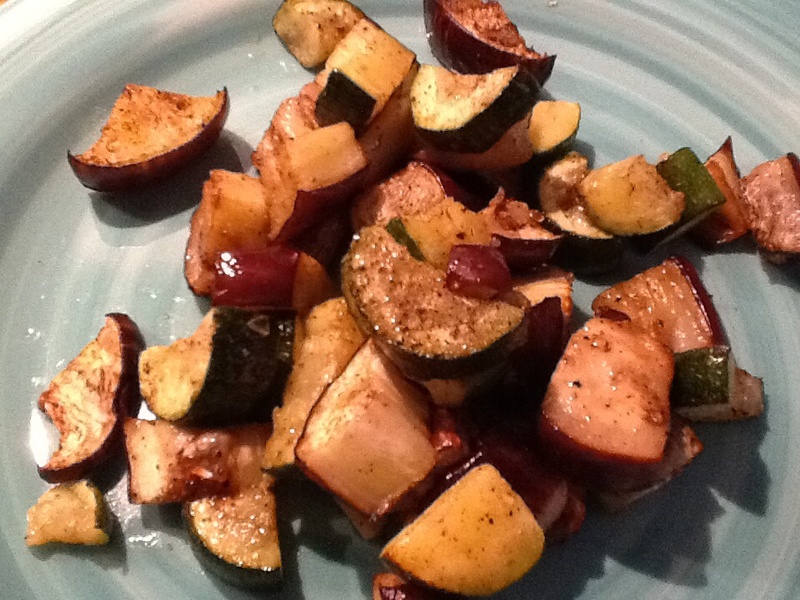 Put the diced aubergine and zucchini on a baking parchment-covered baking tray. Drizzle over 2 tbs olive oil, 1 tsp salt and 1/2 tsp black pepper. Roast for 25-30 minutes, until starting to brown, then take out. It will smell delicious, but don’t eat too much of this yet. Now, dig out your food processor, if you have one. 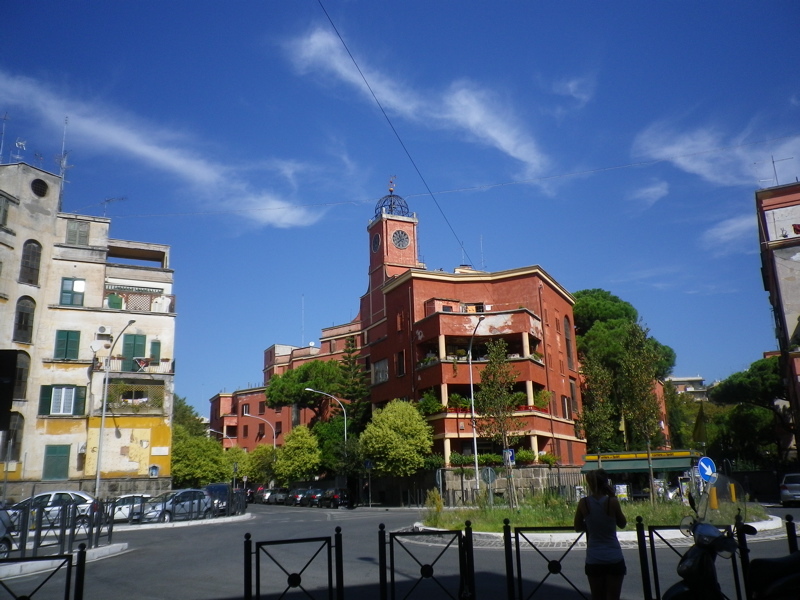 (Or chop and mix at this step.) Set half the roasted zucchini and aubergine aside, and scoop the rest into the food processor. Add the egg, flour, grated cheese, basil leaves and scallion and blitz it until it is roughly mixed. It will not look pretty. 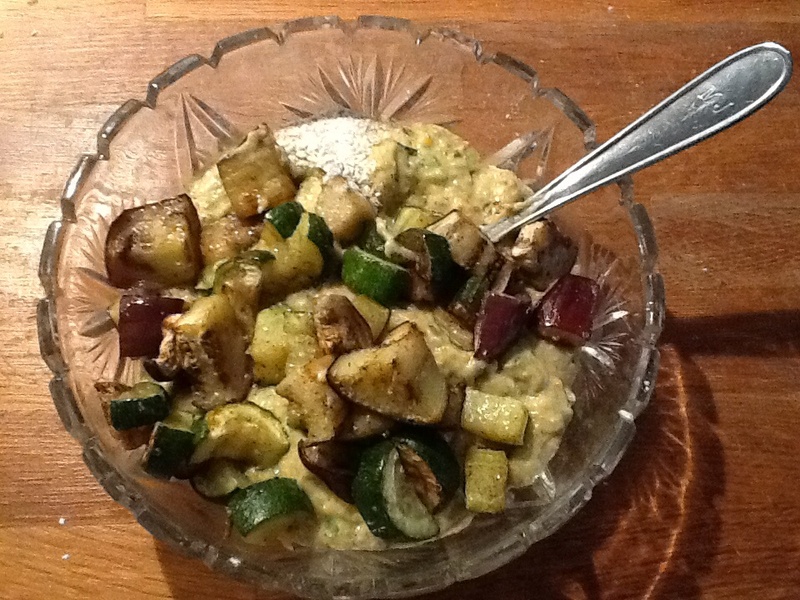 Spoon into a bowl, then add the remaining roasted zucchini and aubergine that you had set aside. Again, do not eat this just yet (though I think this might be really good with pita bread, if you skipped the egg). Heat the last 2 tsp of olive oil in a frying pan, and spoon in a heaping tablespoon of the vegetable batter. Fry until golden and firm enough to turn, maybe 3-4 minutes on medium high heat. When done on both sides, park the cooked fritters on some kitchen roll (optional, these should not be very oily) while you fry the rest. 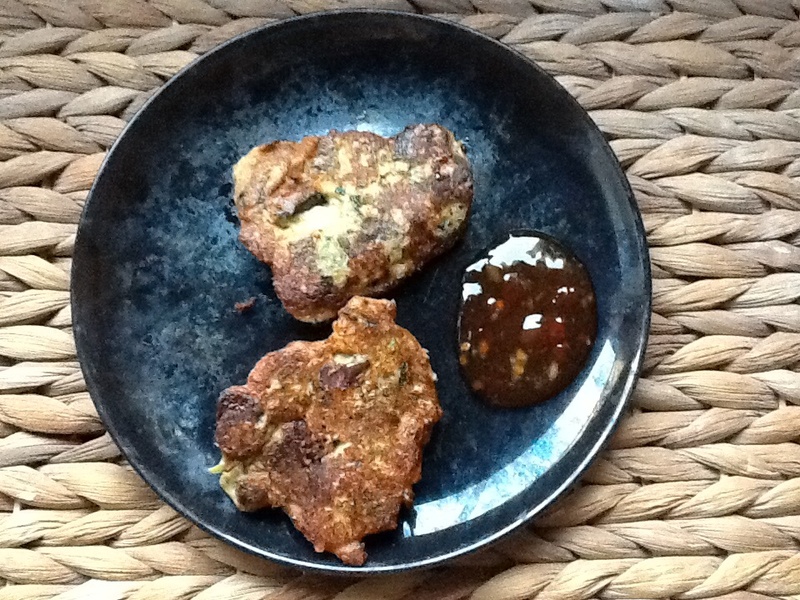 Serve the fritters warm with sweet Thai chilli dipping sauce. A cold tzatziki on the side might be nice instead too. This served two for dinner, with a couple leftover for lunch. 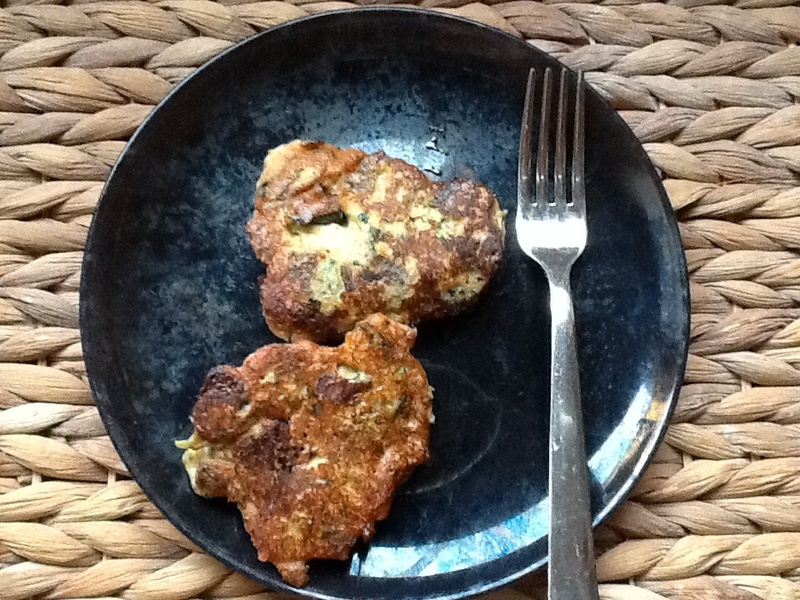 The English in-laws arrive tomorrow for a week, which will be lovely, I may just make these fritters one day for them. I probably overshopped today: shiny dark aubergines, fragrant cherry tomatoes, some crisp pears, and some broccoli romano (looks like a pointy green cauliflower). It all looked so good. The veg drawer is already stuffed, including some declining zucchini, but I feel more prepared this way. It all gets used somehow! 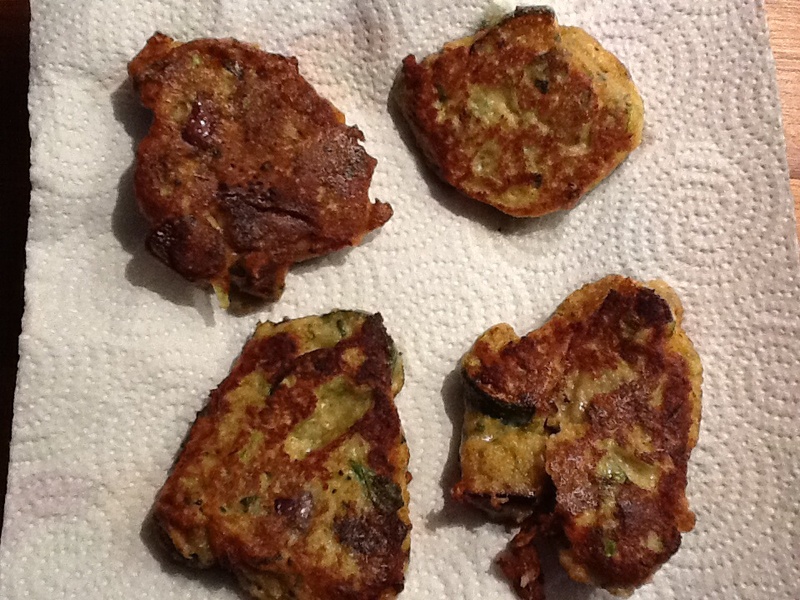 This entry was posted in food and tagged aubergines, fritters, zucchini on October 6, 2014 by krumkaker.